Heeft u een vraag voor AK Hostel? Als u zoekt naar een gunstig gelegen hotel in Bangkok, kijk dan niet verder dan het AK Hostel. Op slechts 33 km afstand, kan dit 3-sterren hotel eenvoudig worden bereikt vanaf het vliegveld. Dankzij de praktische locatie liggen alle belangrijke trekpleisters in de buurt van het hotel. Bij het AK Hostel staan de excellente dienstverlening en superieure faciliteiten garant voor een onvergetelijk verblijf. Maak in het hotel gebruik van een selectie topklasse faciliteiten, zoals gratis wi-fi in alle kamers, bagageopslag, wi-fi in openbare ruimtes, tours, gezamenlijke lounge/tv-ruimte. Het AK Hostel beschikt over 46 kamers, allemaal smaakvol ingericht voor optimaal comfort, met voorzieningen als locker, sofa, internet (draadloos), rookvrije kamers, airconditioning. Daarnaast garanderen de talrijke recreatieve mogelijkheden dat u zich tijdens uw verblijf kunt vermaken in het hotel. Wat de reden van uw bezoek ook is, het AK Hostel is een uitstekende keuze voor uw verblijf in Bangkok. 1. Clean, best location, very comfortable bed, good staff. Hostel decoration and situation is like the advertise picture. 2. So many Chinese tourist, if you stay with them in the same floor, and they are friend group, you will kill them, and they r so noisy, close door and speak ver loud, sleep so late, it will kill you in your next morning. I hope you not meet them in your ak guesthouse day. 3. If not meet chinese group tourist , here will be your best choice. I had a nice stay there. I booked a bed for 3 nights but only stayed 2 nights, but the staff agreed to change my 3rd night to another day. The room and toilet were clean. Hostel near BTS station and I can walk to Siam/Central World through sky walk. 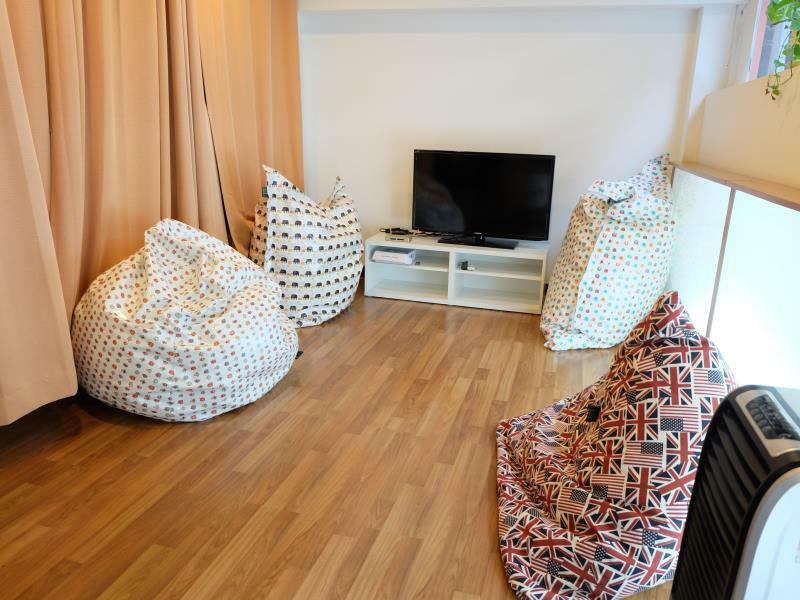 The hostel have very good location, near Chit Lom BTS, 2 Seven-Eleven and Central World shopping mall. The receptionist are friendly and informative, the front desk is empty after 6PM. The building is new, the bathroom is clean. The location is awesome, about 15 minute walk to those famous attractions,central world, pratunam shopping mall and chicken rice restaurant. I stayed in April, 2014. I guess hostel was newly built so the deadly smell of paint still remained strong. The AC in my original room didn't work but the staff changed me to another room immediately. There's a security guy for 24 hours, only speaking Thai, but quite friendly. Only 2 other people stayed here when I arrived, so it was pretty quiet. the location perfect only nearby bts train, if you took female dorm it quite challenge for you have to climb stair up to level 5, but for us its okay we love it. facility such as toilet everything okay. Pros : - near w/ shopping mall and BTS - just need to walk using walk bridge from Chit Lom to Siam. - clean, nice Cons : - does not have stair - no towel, you need to bring it yourself or buy it. You can rent it also but you need to pay for the rent. - washing machine : 40baht (if i'm not mistaken) - does not have TV and soap for dish to clean cup/plate/utensil - does not have place to hang clothes after wash and you need to hang in your room at your bed. Also, deposit 500baht when you receive the key and get back when you check out. Afterall, it is nice to stay. I like it. Location is very good. However, because it is very close to the busy main road and BTS, it is quite noisy. I can still hear the vehicles sound even inside the room with window and door are closed. Nice massage shops nearby this hostel. I stayed 2 nights in 8-10 November 2014 and really enjoyed my stay. The room is clean and comfortable, there is a plug in each bed. The bathrooms and toilets is clean and very nice, and available quite a lot for that size of hostel. The location is just in front of the Chit Lom BTS and lot of motorbike / tuk tuk / taxi available. The problem is there is traffic jam all the time, which is a normal condition for hostek located in center of town. And the price is kinda expensive (400 baht) if you're a strict-budgeted traveller. next to BTS Chitlom, very close CentralWorld & Platinum. The staffs are very friendly & helpful, especially the security guard. Clean room. No elavator. I recommend you stay here if you want to save cost. The location is so good.